Chevron has exploration rights for three blocks of 670,000 acres near the Black Sea, and has also bought the concession close to Barlad for an undisclosed amount with plans to extract gas using hydraulic fracturing. In April 2, 2012 Chevron Corp. suspended activities for the exploration and extraction of shale gas in following protests by residents of Vaslui County against the decision of the Romanian Government to allow Chevron to commence shale gas exploration in a concession area located near the city of Barlad. The agreement has been shrouded in secrecy. So far, the government refused to publish the contracts despite the repeated appeals by the opposition and environment activists. 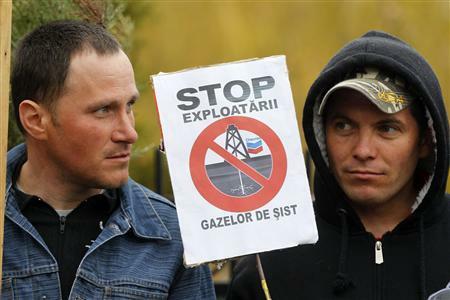 In April 2013, protests against the concession continued with about 500 rallying in the town of Barlad on the eastern border with Moldova, but the government has given the go-ahead for the shale gas exploration to continue. Chevron closed its operations in Romania in 2015. Due to the public pressure but also because of the international context (low oil prices), the company decided it's not profitable to extract shale gas in Romania. Project Details In Romania, Chevron owns rights to exploration and exploitation of gas in Barlad and three areas in Constanta county – Vama Veche, Adamclisi and Costinesti – for which Chevron received concession agreements in March 2012. According to the company, the three onshore blocks cover some 2,700 sq km. Why? Explain briefly. At the moment it seems the government is fully supporting the exploration despite local protests. Chevron however closed its operations in Romania in 2015,due to the public pressure but also because of the international context ( oil low prices) they decided it's not profitable to extract shale gas in Romania. Papatulica, M. (2015). Could Shale Gas Become a Reliable Energy Source for Europe and Romania?. Global Economic Observer, 3(1), 67. Jura, Cristian. Cogito7.3 (Sep 2015): 95-103. EXPLOITATION OF SHALE GAS IN ROMANIA – OPPORTUNITY OR THREAT?